Those words and Lord Ganesha’s appearance in a dream ring ominously in fourteen-year-old Tarun Sharma’s mind as he and his family travel to a festival celebrating the elephant-headed god. Tarun, the son of Kashmir’s chief minister, soon experiences his first taste of danger when terrorists attack the festival. 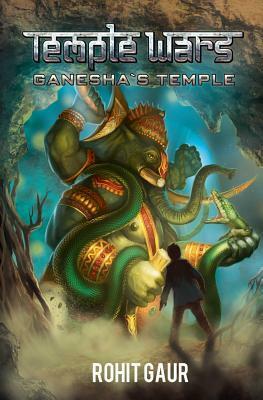 He flees into the wilderness and takes shelter in a cave-where he meets Ganesha and discovers the deity needs his help. Thus begins a journey into a mystical spirit world full of strange creatures and infused by the life-giving power of prana. Tarun must travel into the spirit world to return to Ganesha what’s his. But the clock is ticking as he struggles to avoid the evil Serpentine and races to complete his tasks. If he fails, the disastrous consequences will spill out of the spirit world and devastate the Earth. Travel with Tarun on an odyssey of epic importance in Rohit Gaur’s “Ganesha’s Temple,” the first book in the Temple Wars series. It’s a fantasy adventure with a message that will inspire as a young boy discovers the strength and courage he needs to persevere.